The Salon size 250ml Aloeclear for use in Salons Waxing specialists and Spas. This economical size is ideal to use for applying multiple applications from person to person. The Salon size 250ml Aloeclear . This economical size is ideal to use for applying multiple applications from person to person in a Salon environment. A roll on application is not hygienic for use from person to person in a salon so this pop top 250ml size is ideal! 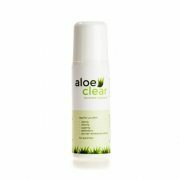 Remember Aloeclear is gentle enough to use straight after hair removal! All the great features of Aloeclear in an economic bottle. Please note that Aloeclear roll on bottles are not refillable.